The processes that occur at the micro-scale site of calcification are fundamental to understanding the response of coral growth in a changing world. For instance, corals possess mechanisms to physiologically mediate the carbonate chemistry at the site of calcification and this biological control may, in part, dictate the sensitivity of coral calcification rates to changing ocean conditions. Yet, further knowledge of the processes influencing the coral calcifying fluid chemistry, together with calcification rates for corals growing in-situ, across natural gradients in environmental conditions is required. 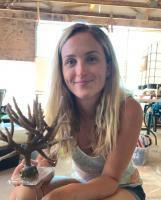 While studies on the coral calcifying fluid have long proven challenging, recently developed geochemical techniques provide a new framework to enhance our mechanistic understanding of the environmental and physiochemical processes driving the calcification rates of corals growing in the field under naturally variable conditions. In addition, trace elements are also incorporated into the coral skeleton during calcification, which can be analysed to reconstruct high-resolution records of past climate that track back hundreds of years providing records prior to the instrumental record. However, our interpretation of temperatures derived from corals using single element- to-calcium ratio proxies (e.g. Sr/Ca) is complicated by physiological artefacts that arise from coral biomineralisation (also known as ‘vital effects’). This has led to the development of new paleothermometry approaches, such as Sr-U and Li/Mg, that account for calcification processes in efforts to reduce vital effects, and isolate temperature. Thus, the application these novel paleothermometers could benefit from further testing across a range of coral genera, particularly those that are common in fossil reef cores (e.g. Pocillopora and Acropora). This thesis investigates the mechanisms and drivers of coral calcification, and evaluate the skill and utility of three coral paleothermometers (Sr/Ca, Li/Mg, and Sr-U). Overall, this thesis demonstrates how the modulation of the chemical composition of the calcifying fluid drives changes in bulk coral calcification rates and how these calcification processes influence coral paleothermometry. These findings provide important insights for predicting the response of coral reefs to anthropogenic CO2-driven warming and ocean acidification, and for accurately reconstructing past climate from coral skeletons. The ability of corals to mediate the chemical composition at the micro-scale site of calcification is critical to the macro-scale formation and maintenance of reef systems globally. Central to the process of coral calcification is the up-regulation of the calcifying fluid pH and dissolved inorganic carbon to elevate the carbonate ion concentration and aragonite saturation state; thereby promoting the rapid formation of their calcium carbonate skeletons. In addition, rates of coral calcification are influenced by numerous environmental factors; most notably temperature, light and the carbonate chemistry of the seawater. Evaluating these drivers is imperative for predicting the future of coral reefs, as well as for identifying potential strategies available to corals to cope with the challenges of Earth’s rapidly changing climate. Understanding the responses of corals to past changes in climate can also help us to predict their future. Yet, where available, temperature archives only date back as far as the instrumental record (mid-19th century onwards). Coral skeletons can be utilised to create high-resolution reconstructions of past temperature that can track back hundreds, and in some cases, thousands of years (e.g. fossil corals); and can thus help to fill these observational gaps. 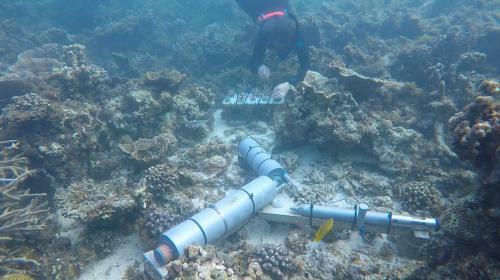 The work described was funded by an Australian Research Council Laureate Fellowship awarded to Professor M. McCulloch, the ARC Centre of Excellence for Coral Reef Studies, and an Australian Post Graduate Scholarship awarded to C. Ross.